As part of the annual West Coast MCC sale, there is a 10k run and 2-mile fun run for all ages. The 10k run is part of the Valley Runner of the Year Series. This will be the 31st year for the Run for Relief. Our daughter-in-law, Christa, had the idea that it would be fun to collect a t-shirt from all the years that t-shirts were available. I admit to being a little skeptical that she would actually be able to collect them all. Silly me. 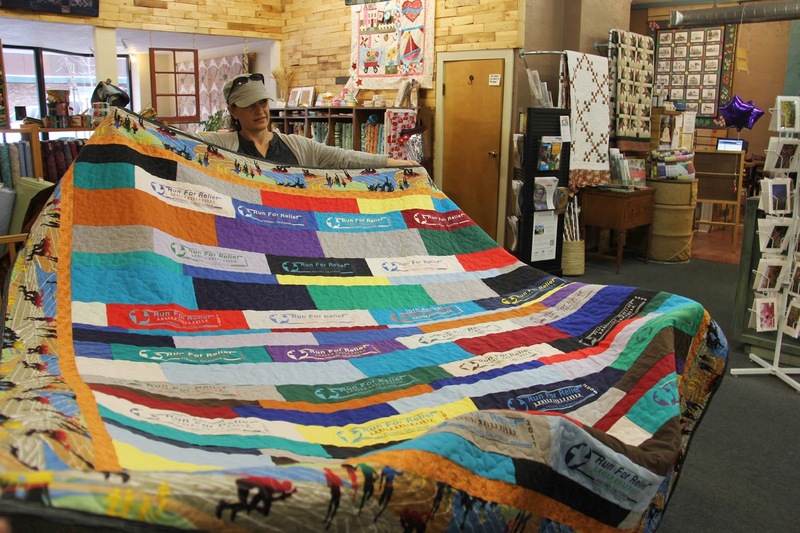 She and her friend, Jamie, made this really fun and sentimental quilt. Prepare to be impressed. I'll let the photos tell the story. Christa had some fabric printed by Spoonflower for the back--the dove logo. Genius idea. Before she delivered it to the MCC Center in Reedley, California, she took it to the track at Fresno Pacific University and took some photos. Ready to see the front?? Isn't it fabulous? Here is Christa delivering it to the MCC Center in Reedley. 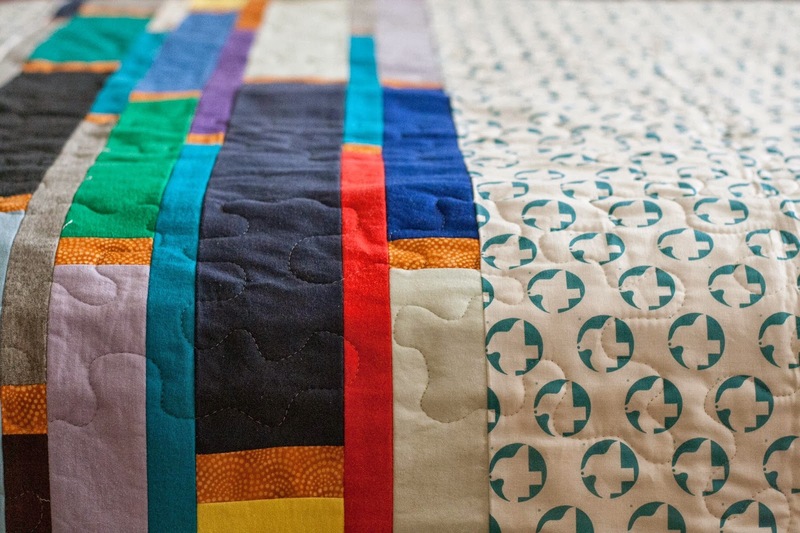 I'm so proud of Christa's vision for this quilt, along with Jamie's help in making it. 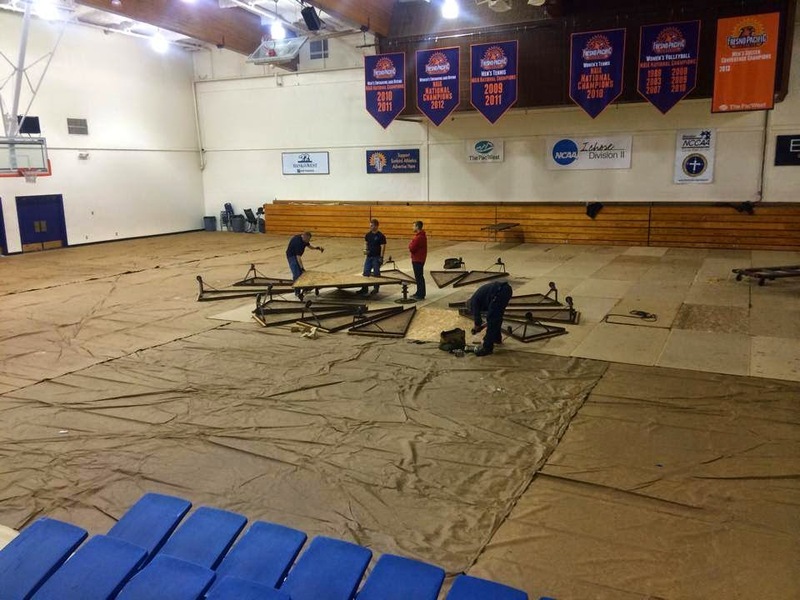 Preparation has already begun in the gym at FPU for the sale this weekend. I'm already getting nervous and excited. Stay tuned. 1. 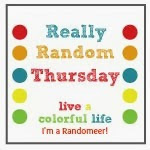 At least one random item in your post. 2. 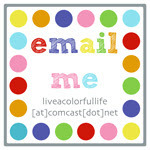 Your blog post needs to link back here. Absolutely fantastic! I'm so impressed they got all the t-shirts. I hope they raise lots of money! What a wonderful quilt! It will certainly be treasured by the winner! 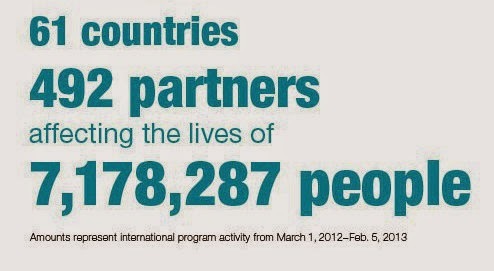 It's amazing what just two people can do. That should be very popular. Way to go ladies! Since this week is my spring break, I actually looked at tickets to join you. 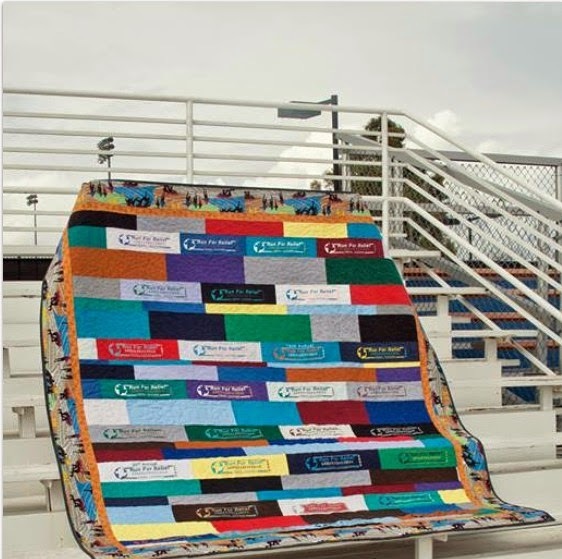 I was most excited to see this quilt auction you participate in by making and buying. Maybe another year. What a brilliant idea and so well done! 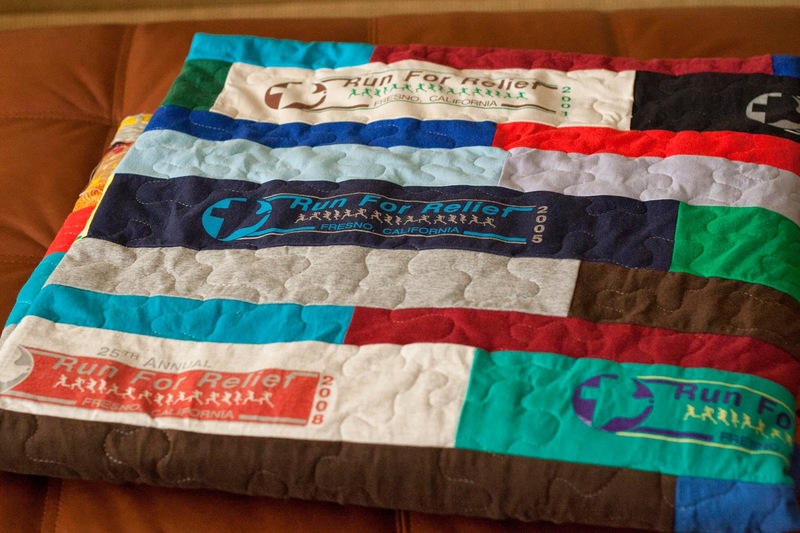 Stunning tee shirt quilt - very modern! Very clever design, front and back. Hope it generates lots of $ for your group. That is amazing!!!!! I know there will be at least two! I can't wait to hear the results. Great t-shirt quilt. I like the MCC logo fabric. Where can I find it on Spoonflower? Great idea and terrific finish! I'm sure it will bring in some $$$. Good luck. What a fun design for the t-shirt quilt! 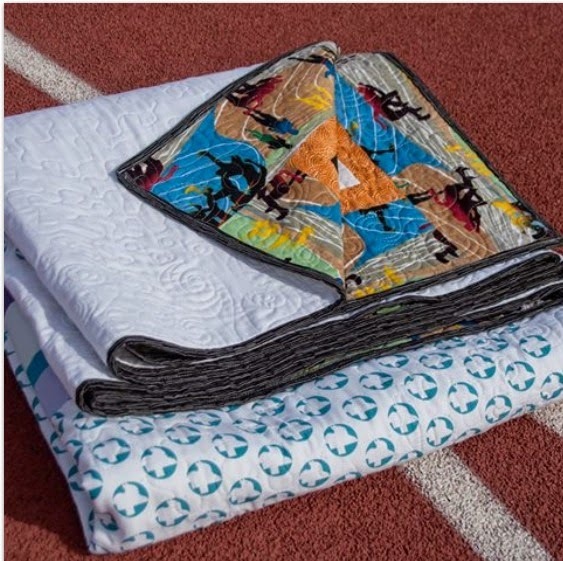 It is wonderful that you both have donated such wonderful quilts for the auction. Are you going to bid against each other?!! Thanks so much for hosting this link-up. I appreciate it. It's a wonderful quilt! How generous of her to make it then donate it. 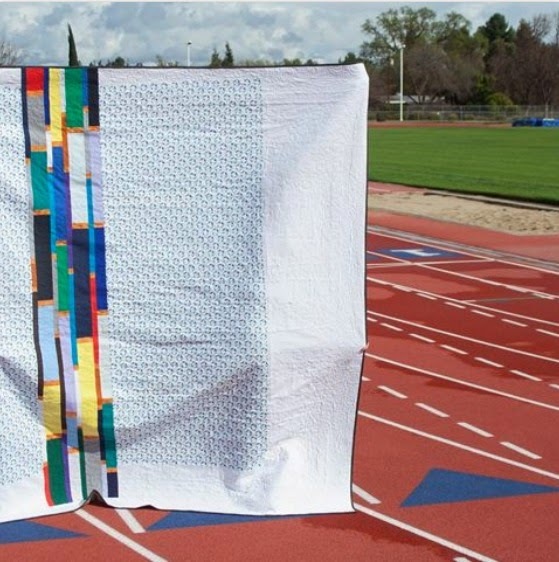 Bidding war may be an understatement for this quilt! What a great quilt! It takes T-shirt quilt to a new level. I hope it sells for big bucks! That is so very impressive! Good for her, you, and EVERYONE! The strip layout is so unique for a tee shirt quilt, I love it. And - brilliant to print the logo at Spoonflower. Good luck with the event. 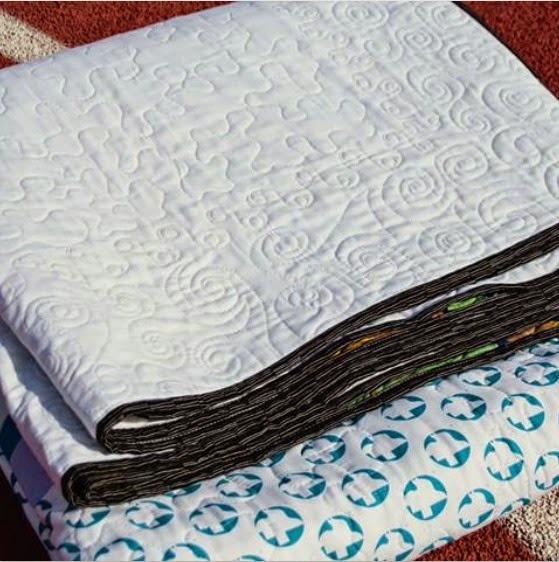 That is a great quilt! 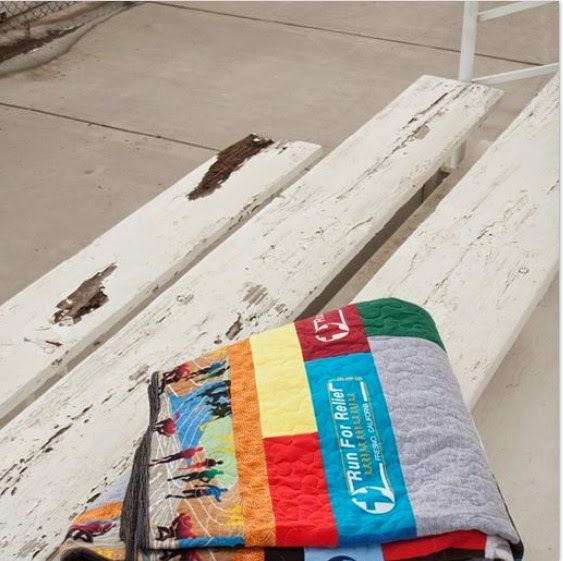 And what a fun way to inspire some runners to bid!